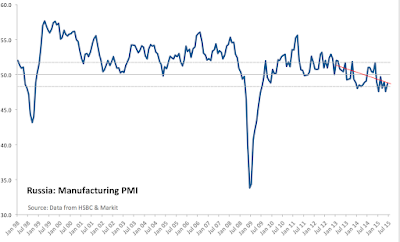 "Operating conditions in Russia’s manufacturing sector continued to deteriorate modestly during June as output, new orders and employment all fell." "Price levels continued to rise, albeit at historically muted rates, while shortages of working capital and input inventories meant firms continued to meet their orders directly from stock wherever possible." 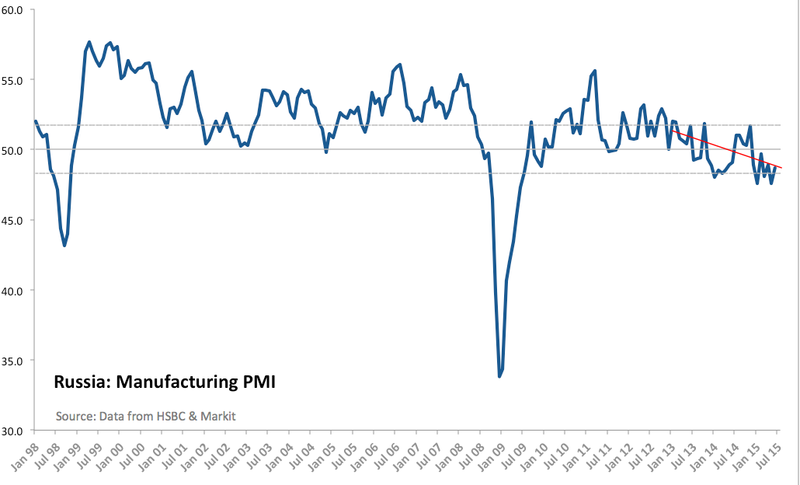 Manufacturing PMI posted 48.7 in June, still in contracting mode, but a slight improvement on 47.6 in May. 3mo average through June was 48.4 against 3mo average through March at 48.5 and 3mo average through June 2014 at 48.8. In other words, the rate of contraction remained broadly the same in 3mo through June 2015 as in previous 3mo period. "Activity levels in Russia’s service sector were down marginally in June as ongoing growth in new business proved insufficiently strong relative to capacity levels. …Capacity was cut in response through to another marked fall in staffing levels." 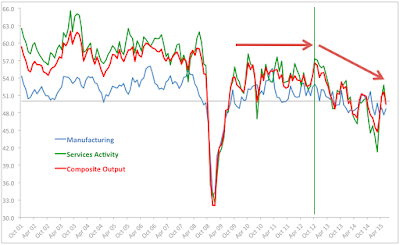 Services PMI fell to 49.5 in June from 52.8 in May, reversing two months of above 50.0 readings in April-May. 3mo MA through June 2015 was 51.0 against 3mo average through March 2015 at 43.8 - a marked improvement for the 2Q 2015. 3mo average through June 2014 was 47.6, which means that 2Q 2015 saw, on average, positive, but weak growth against sharp contraction in 1Q 2015 and moderate contraction in 2Q 2014. 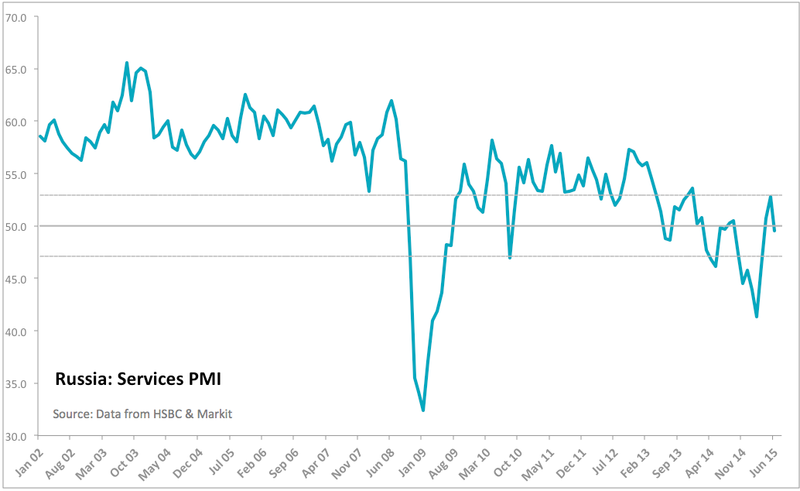 Markit Russia Composite PMI Index recorded a level of 49.5 in June, down from 51.6 in May and a three-month low. Composite PMI 3mo average through June 2015 was 50.6, well ahead of 45.7 average through 1Q 1015 and 48.3 average for 2Q 2014. Again, in quarterly terms, 2Q 2015 was stronger, signalling growth, compared to contractionary dynamics in 2Q 2014 and 1Q 2015. 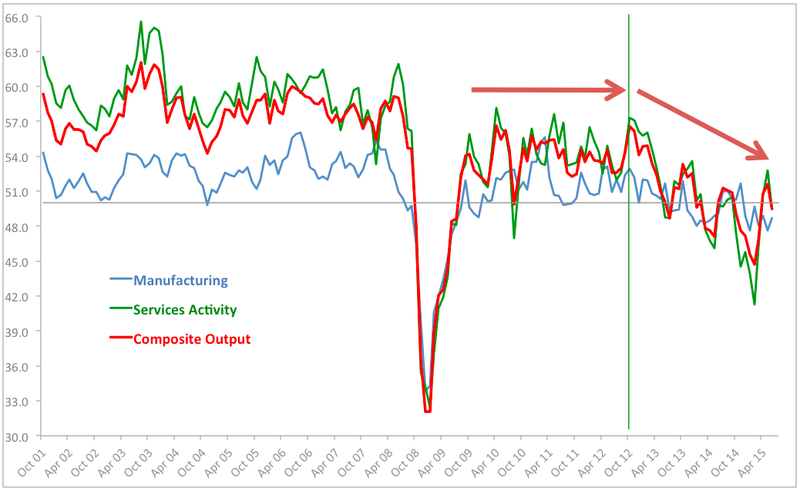 Note: most recent trend (downward shift in overall activity across all two sectors) set in around October 2012 and run through February 2015. Since February 2015, we are seeing some improvements in the series, but no new trend, yet.